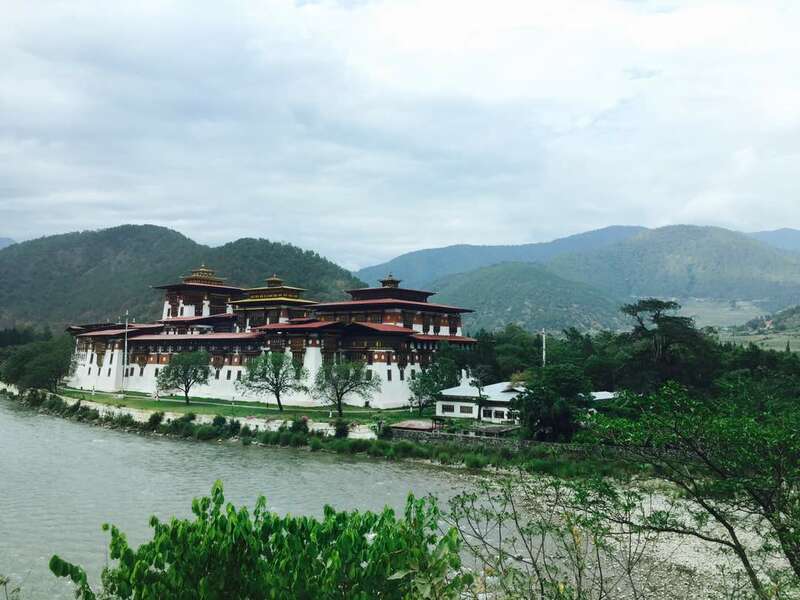 Last year I and my family decided to visit Bhutan - The Land of Thunder Dragon - for our vacation. 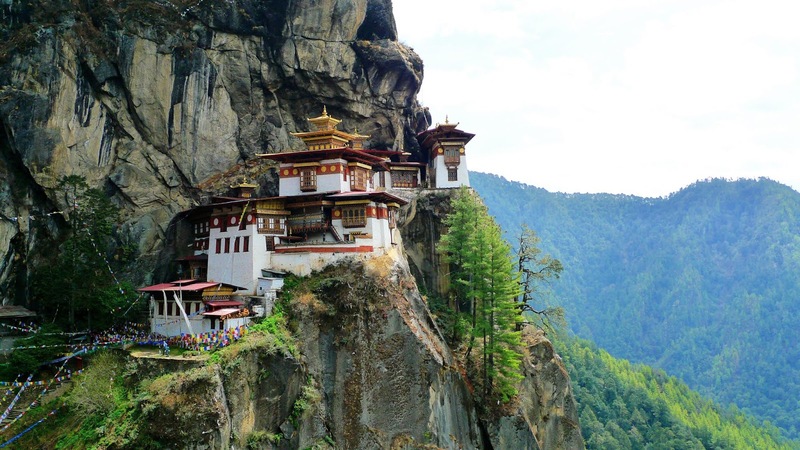 Nestled in the Himalayas, Bhutan is a land of ancient monasteries, scenic landscapes, historic monuments and takes a lot of pride in preserving its traditions and culture dating back to centuries. 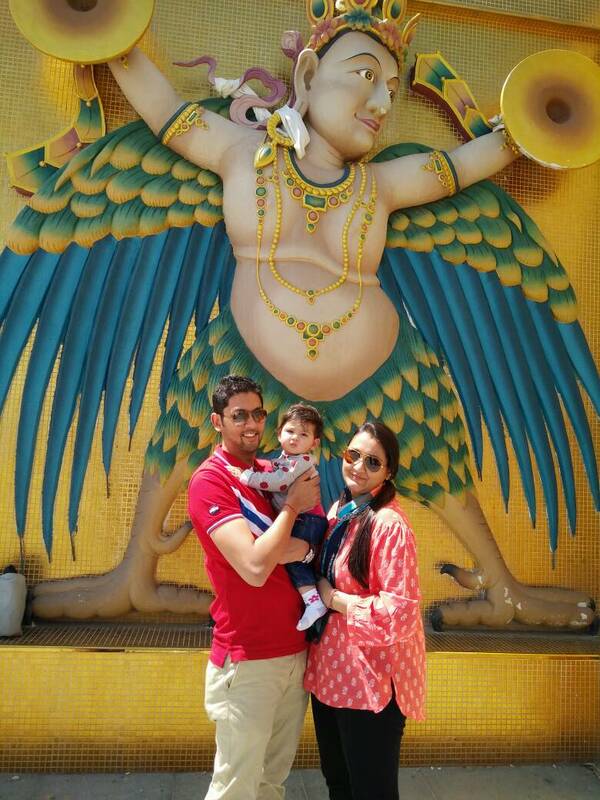 I was both excited and nervous as this was first trip with my 9 month old daughter outside India. Tourists from India, Bangladesh and Maldives are exempted from Visa to enter Bhutan and are not required to pay any fee to the government. However, all other tourists need to obtain a Visa and have to give a daily fee of $250 per day to the government. This daily fee deters many tourists to not visit this country. INR is mostly accepted across Bhutan and there is no need to exchange local currency. 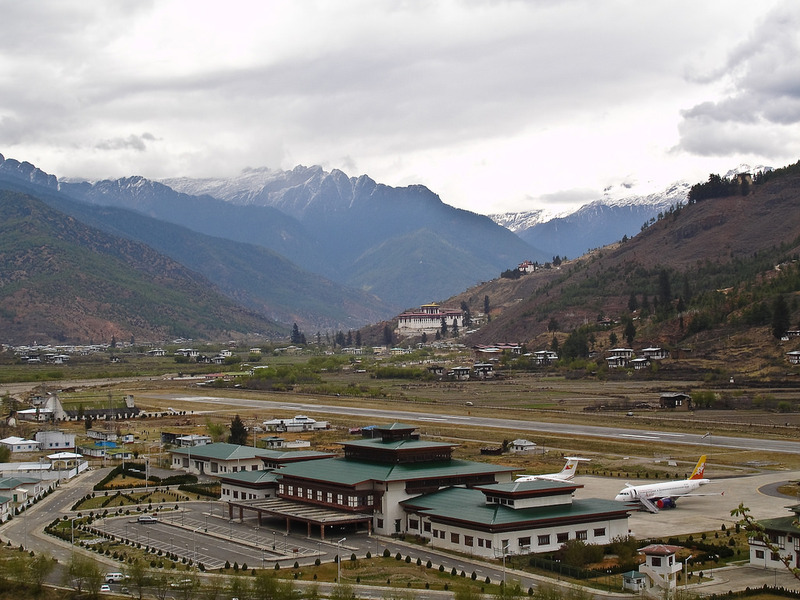 There were only 2 flights that usually fly to Bhutan - Druk Air and Bhutan Airlines, and only a handful of pilots have been certified to land in this country. We chose Druk Air and reached Paro (there is only 1 international airport in Bhutan) in the afternoon and the journey took 2.5 hours from Delhi. The airport is a 1 roof building which is a sight in itself. We had booked a cab from a local agency who drove us to Thimpu, which is an hour away from Paro. We checked in to Hotel Migmar which was 15 mins away from the city and relaxed for a while. In the evening, we explored the city on foot and were surprised to see the city so clean. People were very warm, patient and helpful whenever we asked for directions. Our woolens also came in handy as the temperature was around 15 degrees in the evening, that too in the month of June. After strolling for an hour, we returned back to the hotel for dinner as most of the markets close by 8PM. Today we explored Thimpu and visited several attractions of the city. One of the key facts of Thimpu is that there are no traffic signals within the city. To add to this you will hardly hear anyone honking as people seem to be in no hurry. We first visited a 50m tall golden Buddha statue sitting at one of the mountains as Buddhism firmly prevails in this part of the world. You can hear monks chanting prayers inside the hall and the whole atmosphere was very mesmerizing. After having lunch at a local restaurant (I used Tripadvisor to select few eating outlets), we went to National Memorial Chorten, which was built as a memorial to the late king. The paintings and statues inside the monument provide an insight into Buddhist philosophy. In the evening we went to the market to shop some local stuff and returned to the hotel for dinner. Today we checked out from Thimpu and embarked for Punakha, which takes about 3 hours by car. En route we came across Dochula Pass, one of the most popular tourist destinations in Bhutan. On a clear sunny day one can see vast Himalayan ranges from different angles. Sadly, we could not witness the spectacle as it was mostly cloudy when we reached there. In the afternnon we reached Punakha and checked in to Drubchhu Resort, a family owned property located on the outskirts of Punakha. The best thing about the resort was the quality of food and they even make Indian dishes on demand. We relaxed for a while before heading to Chimi Lhakhang - the divine mad monk’s temple. In the evening we stopped at a nearby market and enjoyed some local food before returning to our resort. After breakfast we headed to Punakha Dzong - a large fort serving as the administrative centre of the district. It is located on a land where 2 popular rivers are converging, so the only way to access is to cross a bridge. It took us an hour to see majority of this fort and it is very well maintained by the government. Further, we headed to a nearby valley where my family did rafting. Since my daughter was only 9 months at that time, my husband and I decided to skip rafting. 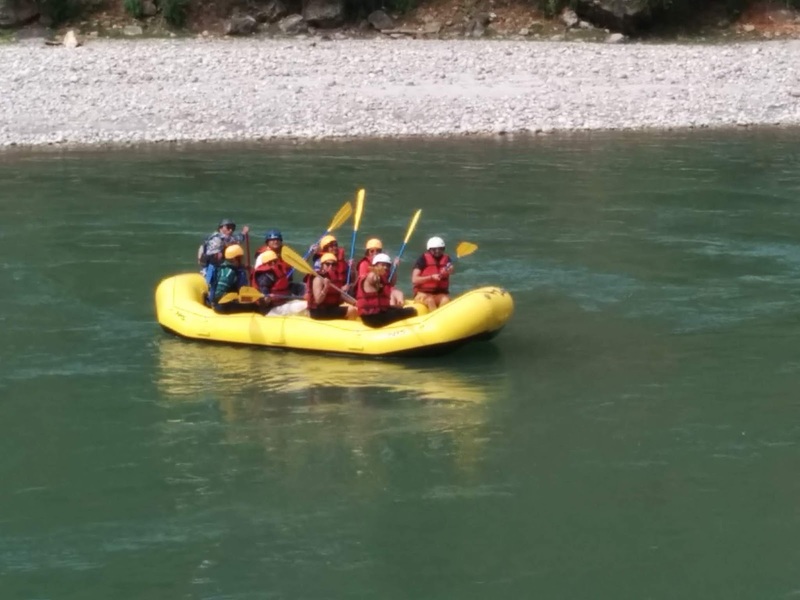 However, this was a fun activity for my parents as they did rafting for the very first time and had a joyful experience. In the evening we went back to the resort and explored places nearby. Today we left Punakha and went back to picturesque Paro via Thimpu, which usually takes 4 hours by car. On arrival at noon, we checked in to Tashi Namgay Resort, which was only few minutes away from the airport on the outskirts of Paro. After lunch we went to Paro Dzong - a large fort that showcases Bhutansese architecture. After spending 30 minutes at the fort, we decided to stroll around the colourful market area which was full of handicrafts, souvenirs stores and local apparel stores. 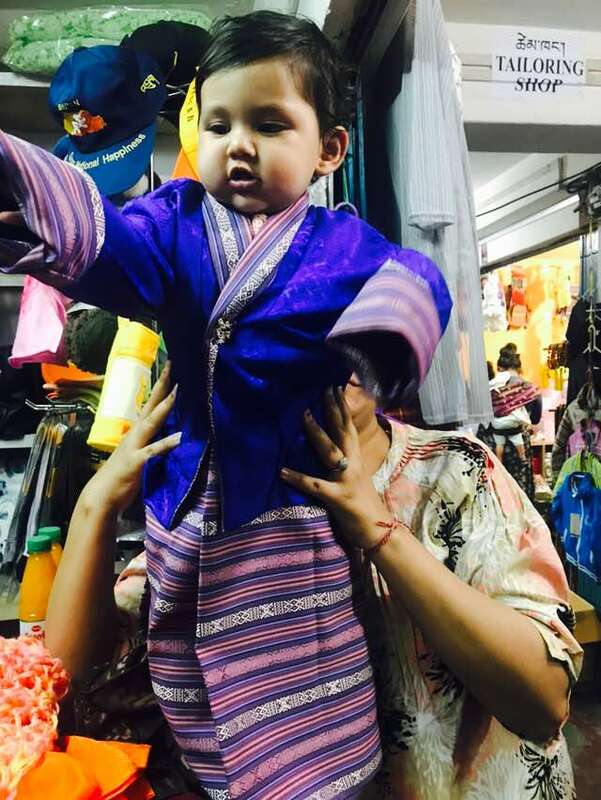 I even got my daughter dressed up in a traditional Bhutanese attire which even she enjoyed wearing. The shop owner was very supportive and did not charge anything which is rarely seen in other parts of the world. We explored the market at our own pace and it was very peaceful as you will not see pushy salesman or shopkeepers calling you in their stores. 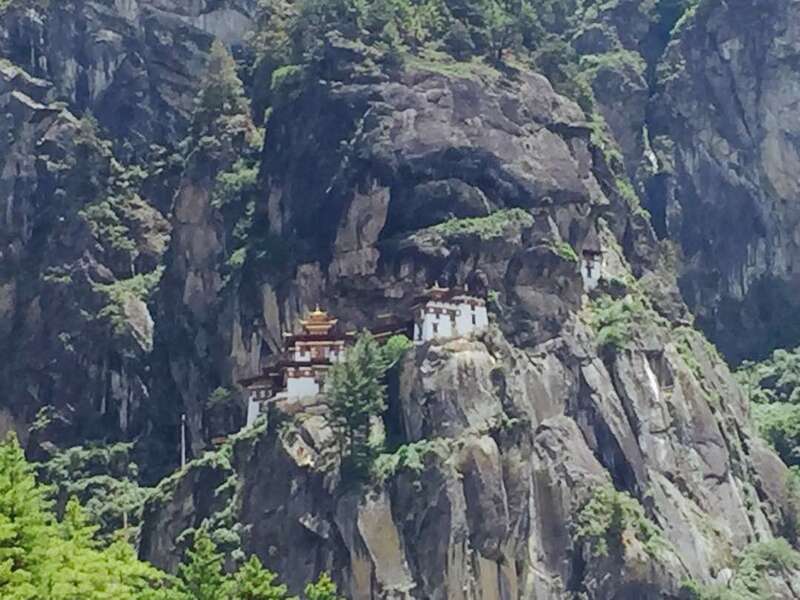 Today our time was fully devoted to the famous Tiger's Nest - one of the oldest and sacred monasteries of Bhutan. It is called Nest as it is clinging from a cliff 3,000 meters above sea level. The path to the monastery is steep and it roughly takes 3 hours to reach to the top.You can even use a pony but till halfway mark. My parents and I decided not to go beyond the halfway mark as it was very difficult to ascend with a baby. So we waited at the cafeteria for the others to visit the monastery. Just one caution here, there is a pass required to enter the Tiger's Nest which you should get in advance to avoid any disruption at the top. It was almost late afternoon when we descended to the starting point and were very tired. So we went back to the resort and spent rest of the day there. Today we headed back to India with a heavy heart after spending almost a week in Bhutan. Majority of the flights depart in the morning only and we reached Delhi by noon. Don't sleep in the flight as you will pass over Mount Everest and on a clear day one can get a nice glimpse of the tallest peak of the world. With abundance of scenic landscapes, natural lakes and the warmness shown by the locals, Bhutan was an unforgettable experience for me. It may not be an economic powerful country but people are still happy, and that is what matters the most. Simplicity runs in their blood and they try to find happiness in the smallest things of life. Backed by a good governance which still prefers people's prosperity over wealth, Bhutan is surely a people's paradise to live. A country that is slowly blending urban life with its traditional culture. A must visit place for everyone! !